Let me rise. Fall. Rise again. Reach for colour, the surface, the healing light. I fall. Rise. Fall again, into the darker underneath. Where tears are windows into the broken raw despair. Drowning in the red soul tapestry, while chaos lays its gifts upon the ground. Many people close to me suffer from or have suffered from depression. It is very difficult to understand for those who are not afflicted with this debilitating illness. Further to the piece that was in the All Guilds Show this spring, this show expands on my interpretation of this theme. Colour has always elicited an emotional response from me. I have chosen to interpret my view of depression through the mixing of colour, rising and falling emotions conveyed through the use of light and dark wool & silk fibres, from soft pastels to searing reds to brooding deep hues, letting them interweave in the felting process, similar to the mingling of complex feelings and emotions. Rips in the surface fabric often reveal the turmoil beneath. Being an optimist at heart, I have incorporated light colours in each piece in a hope to convey that there should always be hope and out of darkness, courage will bring light. It is a journey. The theme for the All Guilds Show was Journey. 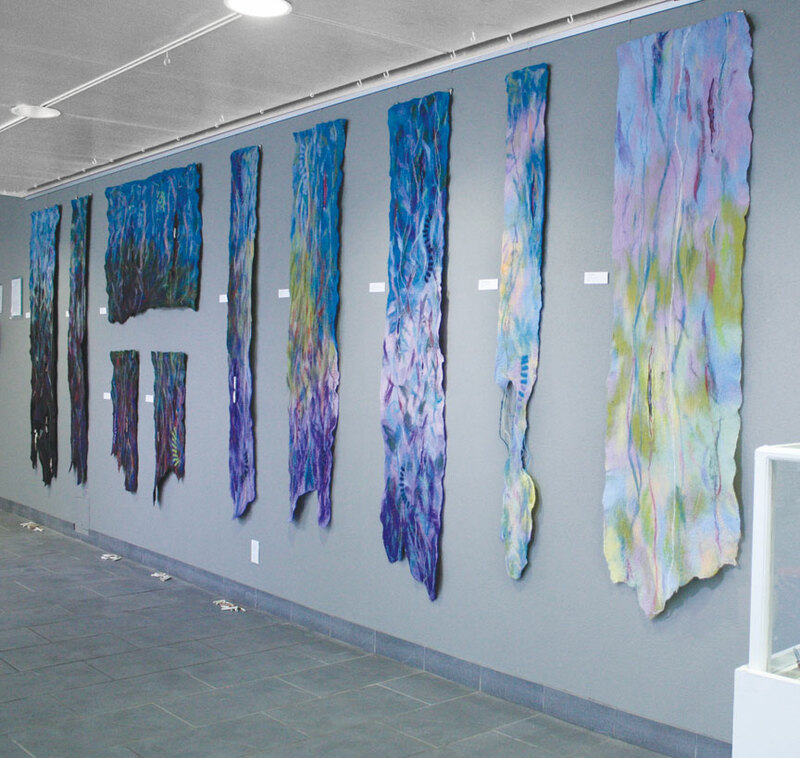 My piece combined both fibre and pottery that depicts a mental journey. The Escarpment Blues by Sarah Harmer was our theme that year. My piece is of 3 vultures, clay, that hang from the ceiling, keeping a vigil over the escarpment. The Potters' Guild chose the book of poetry, A Bee Garden, by Marilyn Gear Pilling, which was to be our inspirational springboard to making a piece for this exhibit. The poems dealt primarily with the suicide of the Author's niece and her father who suffered from dementia. I had a really difficult time with these poems. They are beautiful, but they hit close to home. I too, had a loss due to suicide. In 2006 my nephew hung himself. He was just 15 years old. I also watched my father in a long decline with dementia. But, when I read "V Threnody for Bethany" one line jumped out at me: "She asks the poppy and it gives her a small box of black seeds." In the poem, the girls mother is asking why. Why did this happen? No one has answers. I am rather a literal person and almost immediately I envisioned the box, the seed heads and a felted piece of flowering poppies. I wanted to represent the full circle of life with my piece: the seeds, the buds and flowers, the dead seed heads and back to the seeds. She asks the poppy and it has nothing to give her but seeds. Seeds of hope, of new life. Not to replace, but to honour what came before. The poppy is the flower of remembrance. It's red petals also symbolize blood. I used a lot of red, yellow and orange silk fibres in the flowers so they would look shimmery and alive, in stark contrast to the box and seed heads. 2016, All Guilds Show: Best Adaptation to Theme. 2017, Kaleidoscope of the Arts, Honorable Mention for Fibre body of work.